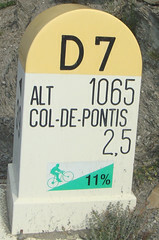 The short, but super steep Col de Pontis. While everyone else took the bus back to Geneva, Doreen and I decided on one last climb – the short, but super steep Col de Pontis. 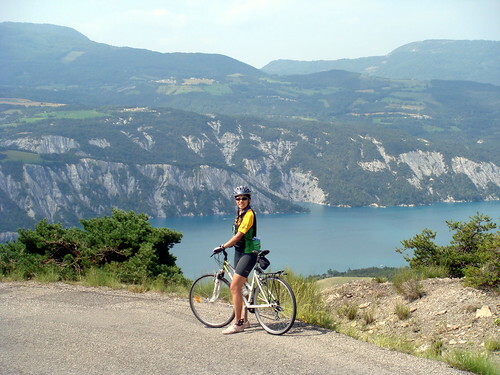 In fact, from Barcelonnette the first 25 kilometres or so are actually flattish or downhill. The elevation chart starts from Ubaye. Tour de France: As best I can tell, this has never appeared in the Tour. This is a pretty amazing climb. STEEP(!) and wonderful view of Lac de Serre-Poncon. Doreen as usual, was unbelievably brave up slopes that terrified me on a very cautious descent. My legs are now officially cooked – time to go home. What about Colombiere over Romme tomorrow? OK, just kidding. Great to know that you survived well and had tons of fun. Now relax/rest a bit and then we’ll pick up more around Gva. Congrats to ALL (ladies and men…&boys).